Grungy | Where is Whitney? I made it to Laramie and decided to check out the Wyoming Territorial State Prison. Laramie is a small college town and there isn’t a whole lot to do there, but there is the prison. I was actually really happy I checked it out! There are a ton of cool old buildings on the site and the audio tour is very informative. Some outlaws make infamous by western movies (such as Butch Cassidy) were incarcerated there and the truth was normally not quite as exciting as the legends. The prison ran a broom factory on site and part of the prison had been used by the university at one point, so not only could you learn about prison life, but you could also find out about farming and old-fashioned broom making. Posted in Uncategorized, Wyoming and tagged bars, Couchsurfing, cowboys, Downtown, Grungy, historic, History, jail, Laramie, museum, Museums, outlaws, prison, road trip, scenic routes, Solo Travel, tours, travel, Traveling, voting, Walking, wandering, women's rights, Wyoming State Territorial Prison. Bookmark the permalink. I was fortunate to get a last-minute Couch Surfing acceptance from Seth in Jackson, Wyoming. Locals call it Jackson, not Jackson Hole. I made that mistake and put Jackson Hole in my GPS and ended up at a parking lot of a resort I couldn’t afford to stare at. When I finally made it into town I walked around and swung into the Grand Teton Gallery. Seth was out in the woods and I needed to kill time before meeting him. I found the right gallery as they were having a magazine launch party that evening! I lucked out! Bar! Who needs a bar! I found a social place with free food (and good stuff – shrimp cocktails, cheese, meat, crackers, watermelon…), wine and lots of art! A few of the pieces in the gallery were from some of the same artists that show at the Plantation Wildlife Arts Festival in Thomasville, Georgia. I do work for the arts festival, so I was so excited to see the work of some artists that I knew! Posted in Art, Food, Life, Nature, Wyoming and tagged Art, Camping, cheap, Couchsurfing, Downtown, Elk, Flowers, folk, Food, free, galleries, Grand Tetons, Grungy, hiking, historic, hot springs, Jackson, Jackson Hole, life, Locals, Mountains, National Park, nature, Parks, Party, Refuge, road trip, scenic routes, Sheep Mountain, Sleeping Indian, Solo Travel, travel, Traveling, Walking, wandering, Wyoming, Yellowstone. Bookmark the permalink. Last week, I arrived in NOLA. Luckily because of the time change I arrived on time, instead of an hour late. I wandered up and down Frenchman Street, while waiting to catch up with my host. I read in a guide somewhere that the locals have their own style. For what I’ve seen it varies from hipster to turn of the century Carny. A friendly Tarot card reader let me know ahead of time about a fire show in the parking lot behind his table. Until the show I hung around Frenchmen Art Market, which had plenty of interesting wares. I spent most of my time at the booth of an independent filmmaker listening to stories about train hopping and the hobo life-style in the documentary Cure for the Crash. 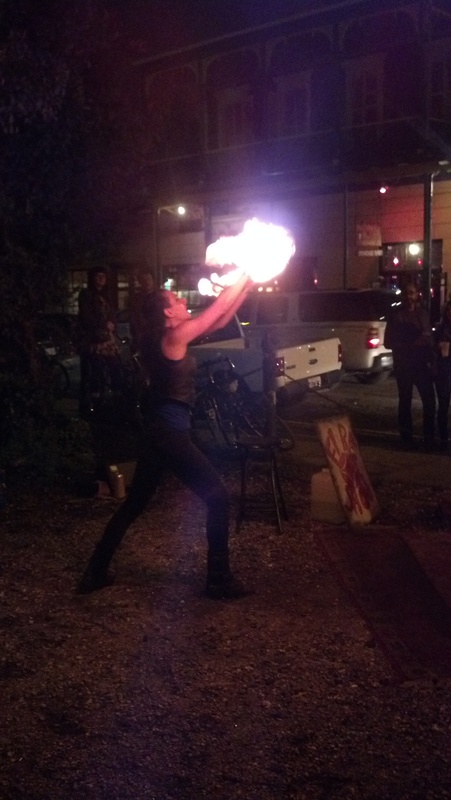 The fire show ended up being pretty amazing too. Posted in Art, Food, Louisiana, Music, South, United States and tagged bands, bars, concerts, Couchsurfing, flood, french quarter, Grungy, Lake Pontchartrain Causeway, Louisiana, New Orleans, nightlife, NOLA, rain, travel, vacation. Bookmark the permalink.